Margarte is a Nord merchant living in Leyawiin, though she will often be found outside the city gathering ingredients for her alchemy. She's married to Eitar and is annoyed by his hobby. She is an advanced trainer in Mercantile and her passion for alchemy will prove useful when a bunch of restless Fighters Guild members are being drunk and disorderly at the Five Claws Lodge. She lives a busy, yet quiet, existence in Leyawiin. Tired of her husband's antics, she leaves her house right after she wakes up at 6am for a two-hour breakfast at the neighboring Three Sisters' Inn. Between 8am and noon she strolls around on the ground floor of her house. Regardless of weather, Margarte leaves Leyawiin through the western gate at midday, and heads a few feet up the mountain southwest of the Five Riders Stables where she stays until 6pm. She then heads back to her house for a few hours, until it is time for dinner at the Three Sisters' Inn at 8pm. At 10pm she returns home and stays there until her bedtime at midnight. On Sundas, she makes an exception to her daily routine and spends two hours, starting at 8am, praying inside the Great Chapel of Zenithar. She will only offer training when she is at home, provided she is not sleeping. Margarte wears a set of lower class clothing, consisting of a shirt with suspenders and a pair of green felt linens. She also carries her house key and a small amount of gold. When you first speak to Margarte she will greet you by stating her name, a bit about her life and occupation, and telling you about her passion, alchemy. "My name is Margarte. Professionally, I'm a trade consultant... I offer Advanced Mercantile training, by the way... But my real passion is alchemy. I love brewing up new and interesting potions... just for fun! It's a pity my busy consulting and training schedule leaves me little time for gathering ingredients... And heavens forfend that my husband, Eitar, devote a few minutes from his all-consuming hobby... stirring up trouble between Khajiits and Argonians, to help me find ingredients." Asking her about her home town, Leyawiin, she will reply, "I'm sure there's an abundance of exotic ingredients to be gathered nearby. In Blackwood, for example, or along the Niben." The townsfolk of Leyawiin will often discuss Margarte and her abilities in both Mercantile and alchemy: "Have you ever spoken to Margarte? She knows a lot about running a business, and about alchemy." and "Has Margarte ever talked to you about running a business?" Others will comment: "She knows a lot about doing business. I don't like to bother her, though. She's a bit touchy when you do." and "She's a smart one. You could learn a lot from her." Indeed, as an advanced trainer, Margarte will not only provide training, she will also start the Mercantile Training quest and point you towards Palonirya in the Imperial City: "If you're looking to be the best in business, you need to learn from the best. Palonirya is one of the best, so you might try asking her. She has a very successful shop in the Market District of the Imperial City." During the related quest, three restless Fighters Guild members cause trouble at the Five Claws Lodge. After speaking to Vantus Prelius, it becomes clear that their unemployment is the real problem. 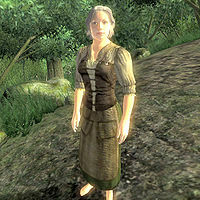 When asking around in town, most townsfolk will point you towards Margarte: "Jobs for the Fighters Guild? Hmmm... try Margarte. If she's not at home or at the Five Claws, she's probably out looking for alchemical ingredients." While Margarte never visits the Five Claws Lodge herself, when asking her about Fighter Guild Jobs she will deny your request if your disposition with her is below 40 by saying, "I suppose I've got something I could use the Guild's help with, but I don't know you well enough to talk about it." or, "I might have something, but I don't know you well enough to trust you'll do it." If your disposition with her is greater than or equal to 40 she will instead say, "I suppose I've got something I could use the Guild's help with. I need ogre teeth and minotaur horn for my alchemy experiments. They're tough to get, but I prefer fresh, and I'll pay well. And I just don't trust those Blackwood Company folks to find them. I'm not sure about you, either. Tell you what. If you bring me back five portions of ectoplasm, I'll give my business to the guild. That's my offer." She will now greet you with "Have you found me ectoplasm?" Asking her about Fighter Guild jobs again before getting enough ectoplasm will have her remind you of your task: "Come back when you've got the ectoplasm, and we'll talk about those other men getting work from me." Speaking to her about this subject when you collect the necessary amount of ectoplasm will have her thank you for your effort, and promise work for your fellow Fighter Guild members: "Well, you've got the ectoplasm! Seems you Fighters Guild types can do a job when you put your mind to it. Tell your men I'll pay them for minotaur horns and ogre teeth. The Fighters Guild will be my sole supplier. I look forward to doing more business." Asking her about the jobs again before reporting to the unemployed Fighter Guild members will have her remind you of her promise: "Like I told you, I can use minotaur horn and ogre teeth. If your Guild brothers bring me some, I'll pay well." If you greet her again, she will say, "There's little more to discuss. If they bring me ogre teeth, I'll pay." Back at the Five Claws, Vantus Prelius will be satisfied with the new assignment: "Find ingredients for Margarte, huh? Works for me. I'll let the other men know. Appreciate your help, friend. And Oreyn should be happy." After the quest is completed Margarte may look at you and say: "Looking for other jobs? Don't look at me." She will also finish conversations with: "I'll be waiting for teeth and horns." From now on, when asking Margarte about minotaur horns or ogre's teeth while you have five of either in your inventory, and after you complete the quest "Drunk and Disorderly", will give you the option to sell them to her. If you ask her about the minotaur horns she will say, "I see you have some. I'll buy them in groups of five for 50 gold. Interested?" If you agree to this deal she will say, "Excellent. Here's your payment. Come back if you find more." If you instead deny the offer she will remind you that to come back if you change your mind: "That's fine. I'll buy elsewhere. If you change your mind, you'll know where to find me." If you ask her about the ogre teeth she will reply, "I see you have some. I'll buy them in groups of five for 100 gold. Are you selling?" If you accept this offer she will give you your payment and say, "Fine. Here's your money. Let me know if you find more." If you deny this offer she will say, "That's fine. I'll find them elsewhere." Drunk and Disorderly: Find out why several of your guildmates are causing trouble in Leyawiin. Mercantile Training: Prove to a master merchant that you have enough capital to receive her expertise. Margarte's class is Merchant, and therefore in the Construction Set merchant services are enabled (with 5 barter gold). However, she will never barter with you and it is not possible to invest in her store. Although she does not provide any true merchant services during the game, she will buy two ingredients at fixed cost (see following note). Following completion of the quest Drunk and Disorderly, Margarte will buy ogre's teeth and minotaur horns from you. She will buy them in bundles of five for 100 gold and 50 gold, respectively. These purchases are done through dialogue options that automatically appear if you have at least five of the items in your inventory. Because it is done through a dialogue rather than as a barter, the amounts are fixed and are not affected by disposition or Mercantile skill. However, the amounts are less than what you should be able to obtain from merchants for the same items (the base value of five ogre's teeth is 375 gold; the base value of five minotaur horns is 275 gold). Esta página foi modificada pela última vez à(s) 05h35min de 20 de outubro de 2015.